The PanOptic™ Ophthalmoscope provides a panoramic view of the fundus five times larger than standard ophthalmoscopes — which makes observing conditions such as hypertension, diabetic retinopathy and papilledema much easier to identify. The leading edge of opthalmoscope technology. 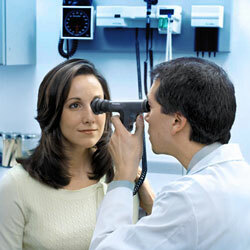 The Panoptic Ophthalmoscope provides many advantages a normal ophthalmoscope just can't match. The Panoptic™ ophthalmoscope incorporates an innovative and patented new optical design called axial "Pointsource" optics. This enabling technology makes it easier to enter small pupils and provides a dramatically wider, more panoramic view of the fundus that's 5X larger than ever before achieved with a standard ophthalmoscope in an undilated eye.Get up to date with latest technology and make your life and your patient's life easier at the same time. The advantages of our PanOptic™ Scope are obvious to patients and practitioners alike. Here are just a few comments. "......the PanOptic enables me to see not only the entire optic disc, but the macula and a broad area of the retina with relative ease. Achieving these views in the past has been extremely difficult, if not impossible." "The breadth of the field of view gives me a much greater visual appreciation of retinal structures. It increases my confidence during an exam." Neal Lewin, M.D., F.A.C.E.P., F.A.C.P., F.A.C.M.T. "The PanOptic Scope enabled my students and residents to easily visualize the optic disc." Robert D. Gross, M.D., F.A.A.P. "This Scope is a giant leap forward in direct ophthalmoscopy. 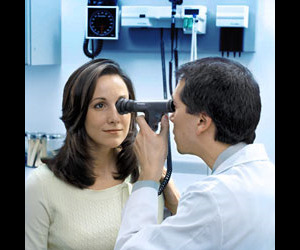 It appears to utilize some of the prinicples of indirect ophthalmoscopy to provide an ideal posterior segment view for primary care physicians."